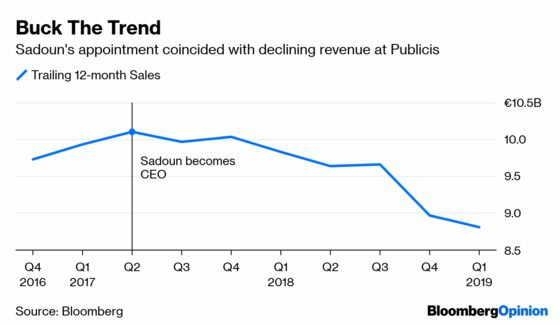 (Bloomberg Opinion) -- Publicis Groupe SA Chief Executive Officer Arthur Sadoun isn’t exactly betting the farm, but he’s certainly staking some very substantial pastures. By the time the firms have realized 60 million euros ($68 million) in annualized savings by 2022, the acquisition will generate returns of close to 5 percent, based on last year’s published earnings. That’s hardly stellar. Still, the deal is probably worth it. Creative agency: the unit closest to the classic advertising business, developing new campaigns. For Sadoun, the first two parts are parts are likely to be the most attractive. They’re also the source of growth – declines at the creative arm dragged Epsilon’s revenue down in 2018. The big gamble is that Publicis, as the world’s third-biggest ad agency, will be able to open more doors for Epsilon. With storied agencies such as Leo Burnett and Saatchi & Saatchi in the group, Sadoun and his colleagues have a Rolodex of chief marketing officers at the world’s biggest brands. 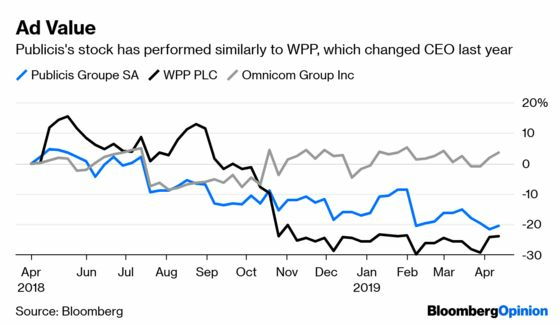 That should give Epsilon more clout to win top-tier clients that they might have struggled to reach as a unit of Alliance Data, whose main business is private label and commercial credit card programs. For instance, Epsilon will get a lot more international exposure – it currently gets 97 percent of its revenue from the U.S., while Publicis derives 54 percent of sales from North America. Sadoun needs the bet to pay off: his firm’s revenue fell in the first quarter. It will take time for Epsilon to broaden its reach. And there will be a notable impact on debt ratios: Average net debt rises to 2.6 times Ebitda from 0.9 times, according to Bloomberg Intelligence analyst Aidan Cheslin. That will gobble up any oxygen for further big deals – but it's hard to find another asset that would be worth the money. Epsilon is the last available acquisition target with vast amounts of digital user information, the sort of data that ad firms otherwise have to buy from third parties. The two other players – Acxiom and Merkle – were acquired by Interpublic Group and Dentsu Inc. respectively in recent years. Publicis is paying less for Epsilon as a multiple of Ebitda than IPG did for Acxiom, and it’s getting more bang for its buck: IPG only acquired the data arm, not the identity resolution component. At least Sadoun isn’t paying a higher premium by coming late to the party. Though Publicis is halting a 1.96 billion-euro buyback program started last summer, shareholders seem to be on his side for now: the shares rose about 4 percent on Monday, the biggest gain in a year. Sadoun’s bet is a substantial one. But he has all the tools to make it work.